Soft drink beverage remains as one of the most popular drinks in the world. Soft drink manufacturing plants need to automate its processes to meet the increasing global demand for high-quality products. Our S17 industrial PC has a corrosion-resistant casing and waterproof projected capacitive touchscreen interface which can operate despite the presence of liquids on the screen. This makes it the ideal device to monitor and control the automated production process. Soft drink factory owners are now implementing an automated system in beverage production to meet its increasing global demands [Beverage Industry]. It is integrated into the most compatible computing technology so that the automation processes can work efficiently. Amongst the most recommended device for these operations are the industrial-grade computers such as the 17” projected capacitive touchscreen PC. This device has an Intel® Core™ i7-3610QM 2.30 GHz processor. This feature allows the device to analyse and assess the product quality. Thus, it helps in increasing the production of high-quality soft drink beverages. As a result, soft drink factories can now have the capacity to provide more output as much as it needs. Now, why choose the S17 panel PC with projected capacitance? What features make our touchscreen device better than other enclosed PCs? Read on through this blog and get to know how it can provide a seamless soft drink production process. Usually, soft drink factories have 24/7 non-stop operations to meet the demands of the global market. Therefore, all the equipment needed for the production process is also at full throttle. However, prolonged usage of the computing device can increase its internal temperature as well, causing the system to fail [Puget Systems]. Fortunately, our 17-inch rugged industrial panel PCs have an integrated the Intel® Thermal Monitoring Technologies. Should its sensors detect high internal temperatures, it can initiate a corrective action which reduces the machine’s power consumption. Hence, it can prevent system errors due to overheating. Imagine drinking a bottle of cola. Are you still fascinated how it is made and maintained it is the same quality until its last drop? All this happened through the use of technology. Moreover, one of the most efficient ways to manage each process is by integrating this industrial computing device into the system. 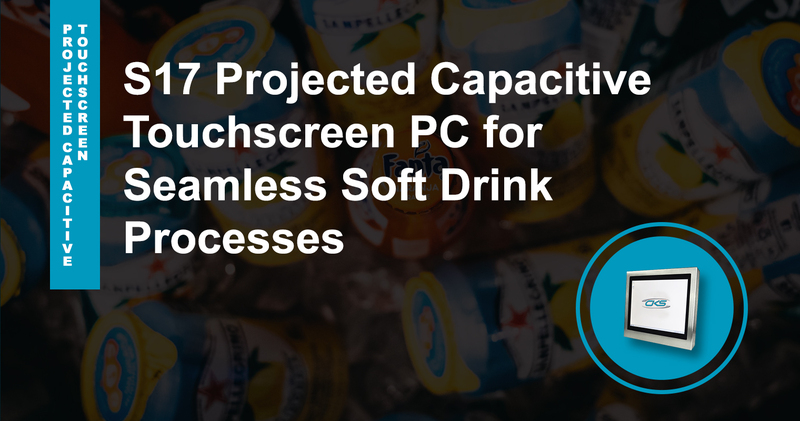 So, take a look at how our S17 advanced PCs can be maximised to monitor the automated soft drink process. Soft drink production often has liquid-based substances as part of the production process. Moreover, spillage incidents may occur while these operations are ongoing. However, our 17” touchscreen panel computerhas an IP69K and NEMA 4 stainless steel casing. This feature can protect the internal components from damage caused by liquids used in the process. As a result, it can still provide efficient functionalities in terms of consistent computing and monitoring of the automated process. Not all industrial computers feature an internal monitoring system. However, our S17 industrial PC has a built-in Watchdog Timer system. This feature allows the device to operate even an extended period efficiently. It also can detect potential program errors that can hinder any soft drink operation. Our 17-inch industrial computer boasts better screen functionality. It is built with a low-voltage differential signalling technology, providing a high 1920 x 1080 resolution dual channel video output. This can ensure that operators can see clearer images on the screen in full details. Hence, a soft drink operator can quickly detect any issues and inconsistencies in the production process. Given the fact that the demand for soft drinks remains high, utilising an automated production system is the ideal solution. However, these processes should be supported and monitored by reliable computing systems. Good news is, our S17 industrial PC has the specifications needed for such kind of complex applications in soft drink factories. So, start integrating the 17” industrial computer today to improve the production rate while maintaining product quality. Request for a FREE Quotes today or contact us through the number (+44) 014 3874 7111 for more inquiries regarding our products.